Break the smoked salmon into bite-size pieces. Heat 2 tablespoons of the oil over medium heat. Add leeks or green onions, and sauté for 2 minutes. Add garlic and salmon pieces. Add the lemon juice, lemon zest, and capers. Taste for seasonings and add salt and pepper if needed. 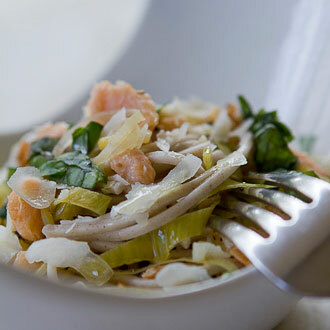 Toss salmon mixture with the hot pasta. Drizzle with remaining 2 tablespoons of oil and top with Parmesan cheese.